Spring has finally sprung! And it's time to get our outdoor spaces spruced up. Our back patio is one of my favorite places to veg out and relax especially since adding a new water feature. There's something about the sound of running water that soothes the soul. Am I right, friends?! I searched high and low for a fountain with a natural and earthy look but everything out there was too modern or ornate for my taste. 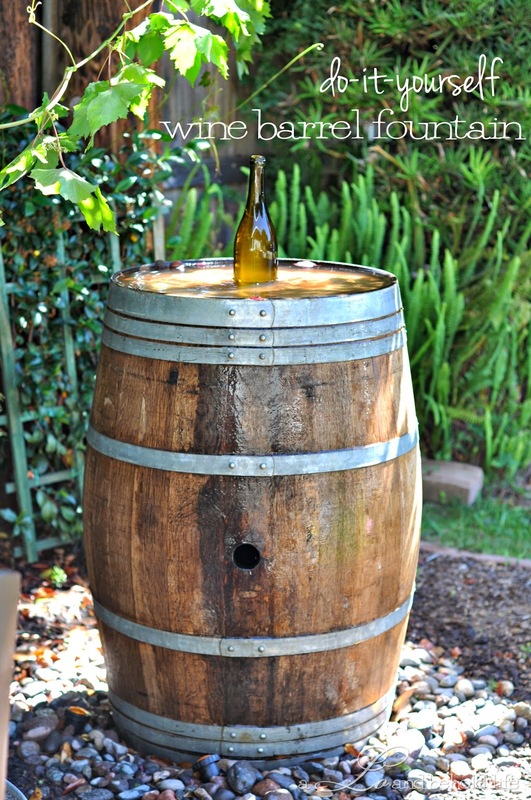 Then one fateful day I happened upon Biltmore Vineyard's up-cycled wine barrel with easy step-by-step DIY instructions. 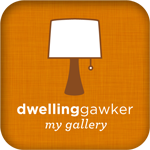 It's exactly the rustic vibe I was striving for. 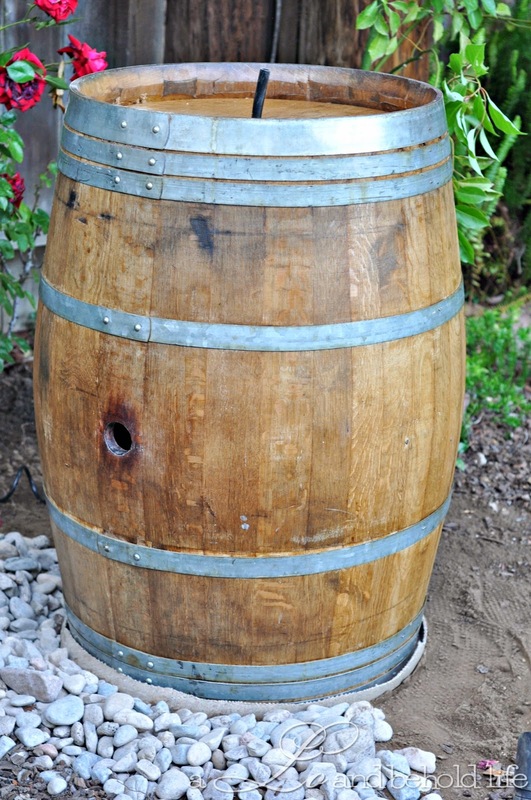 We strayed slightly from Biltmore Vineyard's instructions - we removed the bottom wine barrel head instead of drilling a hole in it so that we could use the barrel head to make a wine barrel lazy susan! In order to remove the bottom pull out the metal rivets and take off the top four hoops using slip-joint pliers and a painter's scraper. Note: do not remove all the hoops as the head may fall into the barrel… and you'll never get it out! 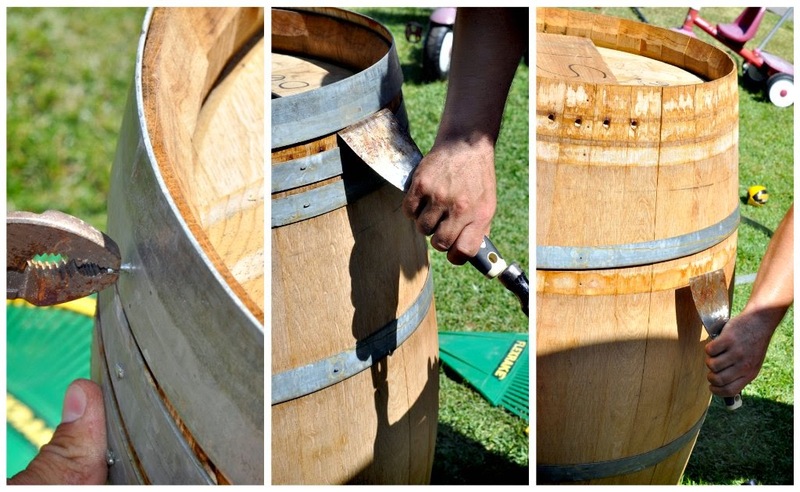 Then pry apart the wine barrel staves and insert shims freeing the barrel head allowing you to pull it out from the barrel. Once the head is removed place all the metal hoops and rivets back on the barrel using a hammer. 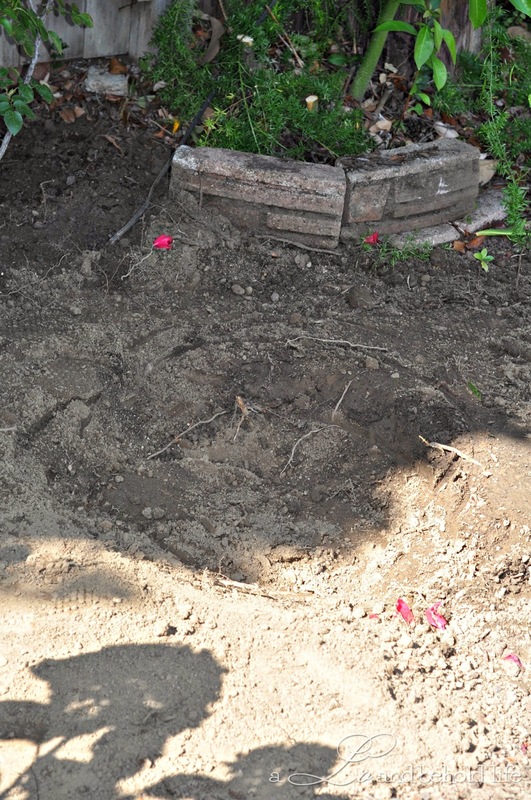 After finding the perfect spot in the backyard dig a shallow hole for the water feature and place the water reservoir in the ground. For this medium sized fountain we used the Total Pond 300 GPH fountain pump from Home Depot. Shimmy the pump hose up through the barrel and out the drilled hole in the top of the barrel head. 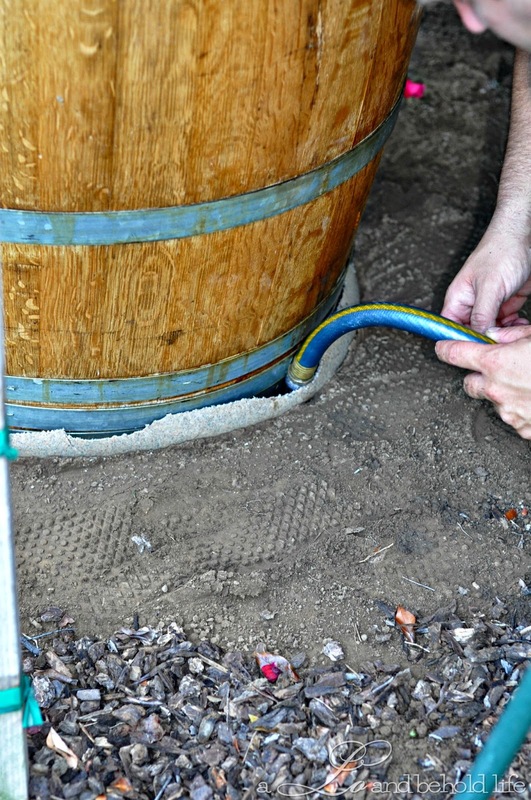 Fill the water reservoir with good old H2O from a garden hose. 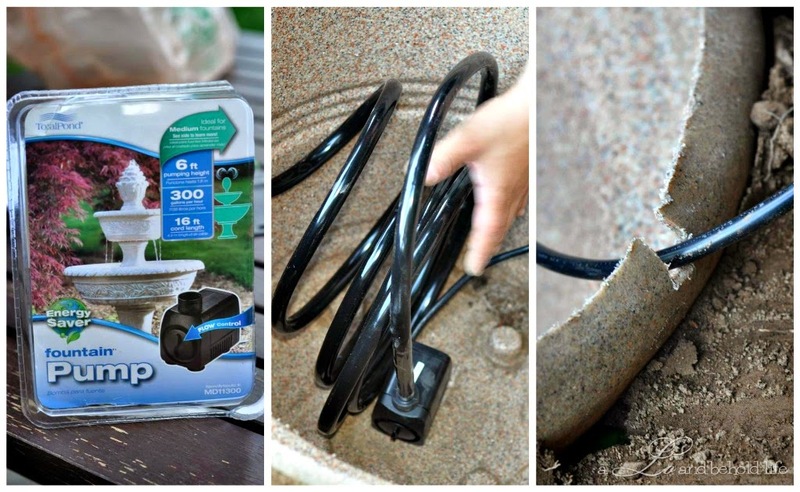 Plug the pump in to get her going and PRESTO - your very own water feature. 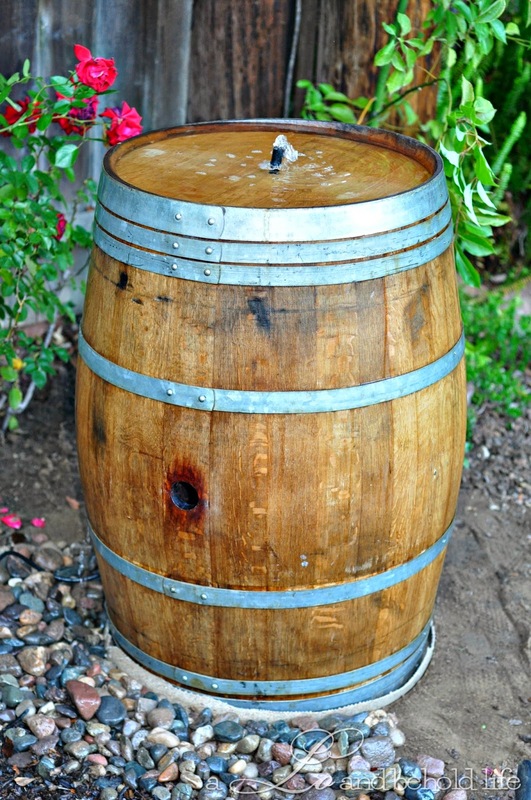 Make sure the barrel is level so that the water cascades evenly over the edges. 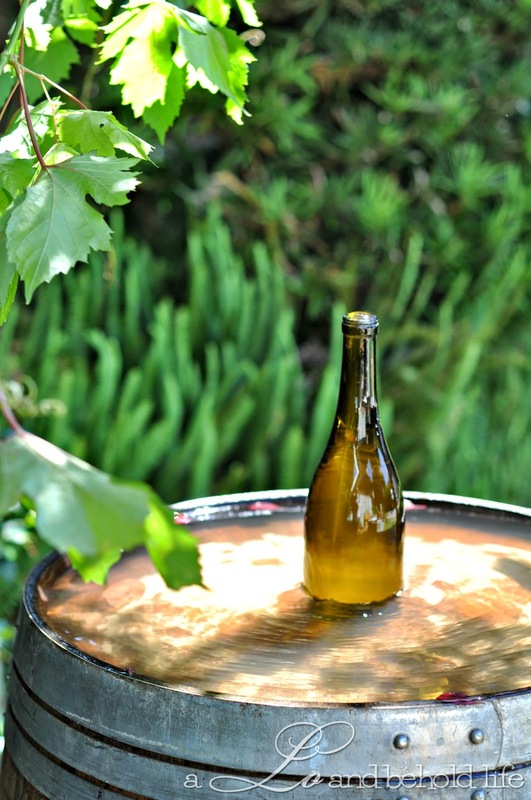 I love the little extra flare of up-cycling an old wine bottle by drilling a pencil sized hole in the bottom of the bottle and placing it on top of the pump spout. 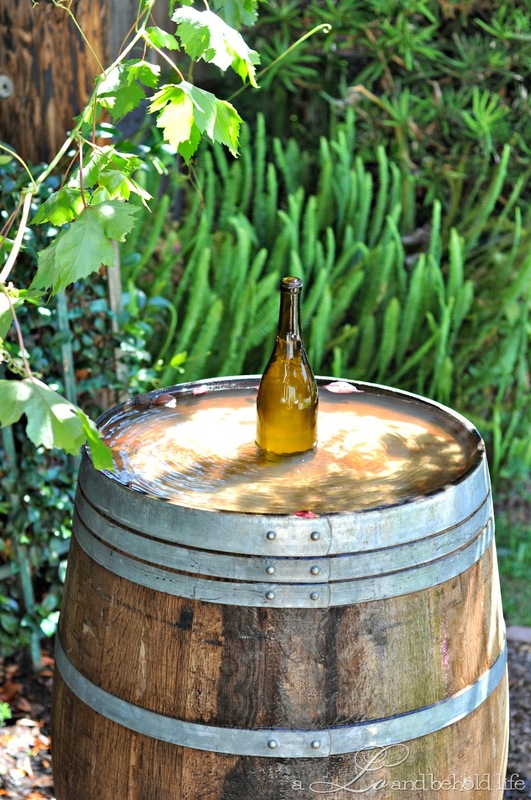 The wine bottle will fill with water and spill over onto the barrel creating that soothing running water sound. 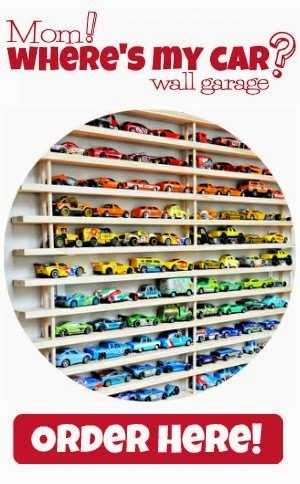 This project from start to finish took a couple hours of one afternoon. If you're thinking about adding your own water feature to your outdoor space this Spring be sure to check out these detailed step-by-step instructions.